The Territory's CDBG Disaster Recovery Action Plan to spend $1.86 billion on housing, infrastructure, and economic revitalization has been available for public comment during it's initial development and for the changes proposed under Amendment 1. Any future substantial amendments will also be available for public comment, information for which will be available here. 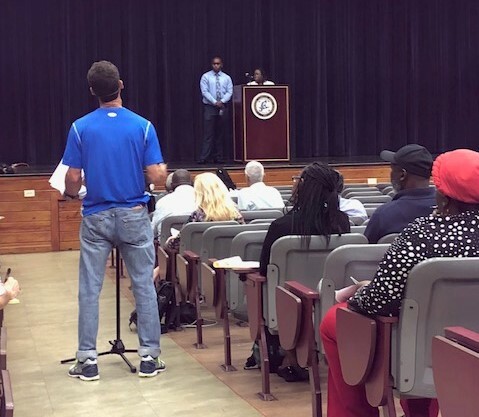 To see the video of the St. Thomas Public Meeting on Amendment 1 on October 2, 2018, please click here. Physical copies of the Action Plan and Proposed Amendment 1, with a Spanish translation, were available at VIHFA and partner government offices, public libraries, and post offices. A large print version was available online and in print upon request. This website continues to be compatible with Google Translate and screen reader software. All meeting locations will continue to be ADA-accessible and language (Spanish or French Creole) and accessibility services for hearing or sight-impaired available upon request (with 48-hours’ notice). Advocates of vulnerable populations who may need additional resources to engage with the CDBG-DR planning process are encouraged to contact the VIHFA. A list of vulnerable populations that will continue to be outreached to directly and information about equitable accessibility is available in the VIHFA Citizen Participation Draft Plan. For questions or any accessibility needs, please call 340-772-4432 or write to cdbg-drcomments@vihfa.gov.